Just another reminder that UCLA is marching ahead with its plans to build the grand hotel where parking structure #6 and the Ackerman-area bus turnaround now stand. There are two lawsuits pending but the build-and-bond folks are anxious to put "facts on the ground." 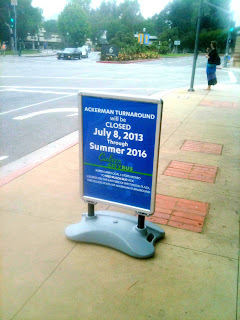 Bus riders will be displaced starting July 8 and during the construction period, as the sign indicates.